According to the National Institutes of Health, at least 500,000 Americans suffer from Parkinson’s disease, and about 50,000 new cases are reported each year. The disease is a progressive neurological disorder that is caused by the degeneration of neurons in a region of the brain that controls movement. Tremors are the most common symptom, but others include rigid limbs and slow movement. 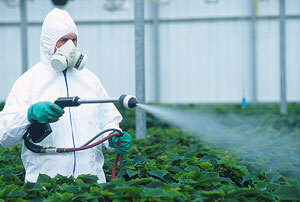 Here on EBL, we’ve previously written about a potential cause of Parkinson’s disease – namely exposure to pesticides. This summer, there is new evidence about possible causes of the disease, and one way to reduce the risk of developing it. First, there is a new meta-analysis published in the journal Neurology that confirms our previous report: exposure to pesticides significantly increases the risk of developing Parkinson’s disease. The analysis included a total of 89 studies. Specifically, it found the weed killer paraquat and the fungicides maneb or mancozeb yield approximately a 2-fold increase in the risk for developing Parkinson’s disease. Farming and living in rural areas were also found to pose significant risks. Another systematic review published this month found that increased iron levels in the blood are associated with a reduced risk for developing Parkinson’s disease. The analysis included more than 20,000 people with Parkinson disease and nearly 90,000 control patients. The authors concluded that the underlying protective mechanism is unclear, and more research is needed before we can develop specific treatment or prevention regimes. For a disease as wide spread and debilitating as Parkinson’s, continued research is important so that health professionals can develop evidence-based methods for prevention and treatment.